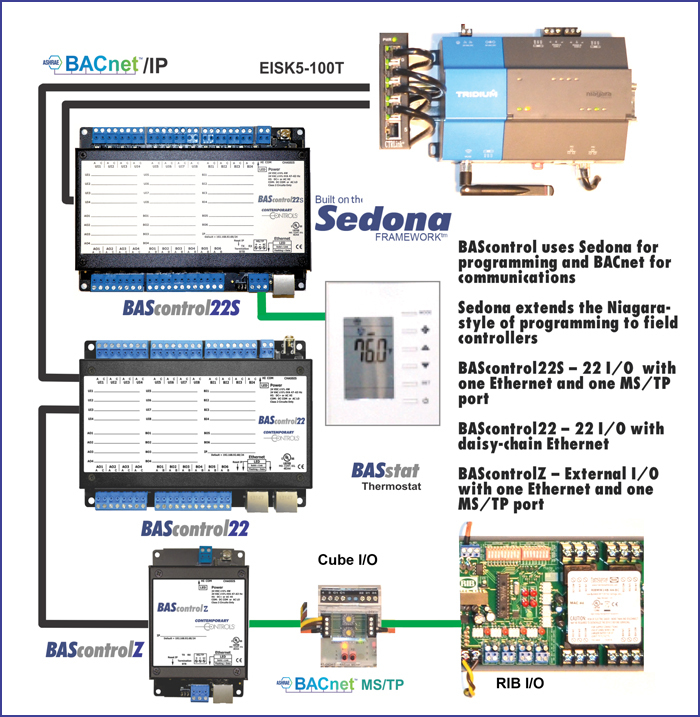 Using BACnet's open protocol and the open control language provided by Sedona Framework, along with the SAE, the BAScontrol Series becomes a truly open controller and feels very much like programming a Niagara device. The new BAScontrolZ and the recently released BAScontrol22 offer BACnet client and server capabilities allowing these devices to respond to commands from a head-end while commanding attached BACnet MS/TP I/O modules from the Cube I/O and RIB I/O families. The BAScontrol20 offers 20 points of I/O while the BAScontrol22 offers 22 points and a daisy-chained Ethernet connection. The BASstat is a BACnet MS/TP communicating thermostat for staged heating/cooling RTUs and for fan coils. The BAScontrol devices can be programmed using Niagara Workbench 3.7 or 3.8. We've also created the Sedona Application Editor (SAE), which is a free tool we provide that allows users to program Sedona-compliant devices from any Sedona supplier. If you or someone you know is new to programming controllers, be sure to download the SAE. Also included with SAE is a Sedona simulator to allow you to try Sedona programming without needing a Sedona controller.